Acknowledged author Linda Anne Silvestri PhD RN wrote Saunders Comprehensive Review for the NCLEX-PN® Examination, 7e (Saunders Comprehensive Review for Nclex-Pn) comprising 1040 pages back in 2018. Textbook and etextbook are published under ISBN 0323484883 and 9780323484886. Since then Saunders Comprehensive Review for the NCLEX-PN® Examination, 7e (Saunders Comprehensive Review for Nclex-Pn) textbook received total rating of 4.5 stars and was available to sell back to BooksRun online for the top buyback price of $18.55 or rent at the marketplace. Review for the NCLEX-PN® exam with leading NCLEX® experts Linda Anne Silvestri and Angela Silvestri! 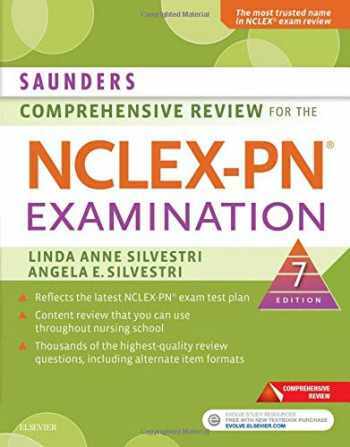 Saunders Comprehensive Review for the NCLEX-PN® Examination, 7th Edition provides everything you need to prepare for the NCLEX-PN exam ― a review of essential nursing content, more than 4,500 NCLEX exam-style questions, detailed rationales, and test-taking tips and strategies. Based on Silvestri’s proven Pyramid to Success, the book includes many questions that test the critical thinking skills you need to pass the NCLEX. An Evolve companion website adds a pre-test that generates a study calendar, study questions with immediate feedback for both correct and incorrect answers, and practice exams with immediate scoring. Updated to reflect the latest NCLEX-PN test plan, this complete review is a perennial favorite of students preparing for the NCLEX.More than 4,500 practice questions are included in the book and the Evolve companion website.Detailed rationales are provided for both correct and incorrect answer options. Alternate item format questions include multiple response, prioritizing, fill-in-the-blank, figure/illustration, chart/exhibit, graphic option, and audio/video clips, as the NCLEX-PN exam is no longer limited to multiple-choice questions.UNIQUE! A 75-question pre-test on Evolve provides feedback on your strengths and weaknesses, and the results generate an individualized study calendar.An 85-question comprehensive exam in the book matches the client needs percentages identified in the NCLEX-PN test plan.Pyramid to Success sections at the beginning of each unit provide an overview of content, guidance for your review, and the subject’s relative importance in the NCLEX-PN text plan.Pyramid Points and Pyramid Alert boxes identify content that typically appears on the NCLEX-PN exam.What Should You Do? boxes in each chapter help you develop critical thinking skills, with answers at the end of the chapter.NEW! Current NCLEX-PN test plan is incorporated into this review, including the exam’s newly added content.UPDATED test-taking strategies are included in a separate chapter and for each question to give clues for finding the correct answers. UPDATED Priority Nursing Action boxes help you to effectively prioritize nursing care, and include detailed rationales and textbook references.NEW! Learning objectives tied to client needs are provided for each unit in the book.